One of the least known regions of Italy, Puglia is a joy to discover for many reasons. Its elegant towns have backstreets perfect for wandering before savouring a long lunch of orecchiette or frutti di mare. The distinctive round trulli houses, with their white walls and conical grey roofs, are scattered across the Vale d’Itria. This is particularly the case in Alberobello, where 1400 have been awarded UNESCO protection. At the coast, fortified watch towers stand guard over small sandy bays and the turquoise Adriatic Sea. 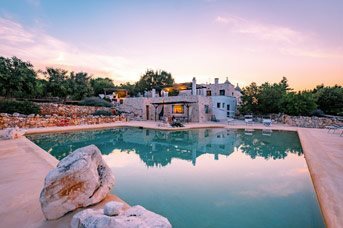 A villa holiday in Puglia gives you a relaxed and comfortable home from home to explore this unique region of Italy. For food lovers, Puglia is still a region which relies heavily on the land and sea for producing its food, known as cucina povera. You can appreciate the countryside by hiring a bike and cycling through the small villages and farmland where almond and cherry trees blossom in spring, and in the autumn, the grapes and olives are harvested for wine and oil. There are olive trees across Puglia, from the coastal plains to the Vale d’Itria responsible for 40% of the total amount of oil in Italy. Puglia lies in the south-eastern corner of Italy, often referred to as the heel, bordered by the Adriatic Sea. The main city, Bari, is situated roughly halfway along the region’s coastline and has one of its main airports. The port town of Brindisi lies further south is where the other airport is located. Daytime temperatures here rise to around 20 degrees Celsius by the end of April, while summer begins in late May and lasts until the end of September. In July and August, daytime temperatures rise to around 30 degrees Celsius. You can expect a few degrees difference in the temperature between the coast and the inland Vale d’Itria Valley, which is around 400 metres above sea level and tends to be cooler. For the local Pugliese, the evening begins with the passeggiata, when each town’s residents take to the streets after a siesta to stroll around and chat to friends while dusk falls. You can either participate and appreciate the effect the golden sunlight has on the limestone buildings at this hour, or enjoy an aperitivo, or drink, at one of the many bars found in each town. Dinner doesn’t tend to be eaten until at least 8pm – although you’ll find some restaurants open earlier – and is very much a family affair. Puglia traces its roots back to the ancient Greeks, but you’ll also find artefacts from Roman amphitheatres to defensive towers built by Norman, French and Venetian rulers. The Spanish occupied during the 17th century too, when many of the finely decorated Baroque churches and palazzos were built. The distinctive trulli houses which dot the land date to the 18th century as a way of avoiding building taxes. Throughout all the changes, the olive groves have remained, some of which are centuries old. In Puglia, the way of life is still very traditional. Throughout the year, there are festivals. Each town has its own saint and there is a day or several days of festivities and services to commemorate them. In addition, there are music, art, food and wine festivals across the summer months with some of the most notable taking place in Martina Franca and Ceglie Messapica. Every town has a market day if you fancy doing some shopping, or even just a spot of people watching. Along the length of the Vale d’Itria valley there are many fascinating towns, each with their own distinct appeal. On the coast, the towns of Polignano a Mare and Monopoli are great for a day out as you can combine a visit to a local beach and a stroll through their historic centres. To the south of Brindisi lies Lecce, a town famed for its Baroque architecture and well worth a visit. Known as cucina povera, the food of Puglia is simple yet very tasty and makes the best use of locally sourced fruit, vegetables, fish and meat. In recent years, it’s become more renowned for its wine production with Negroamara and Primitivo being the most popular grape varieties. Every town has a pizzeria although the wood fired ovens are only lit in the evening due to the heat. In the centre of the region, close to the coastal town of Monopoli is Fasolandia, a theme park and zoo all on one site. Near Monopoli, Aquapark Egnazia, open from June to September,has pools and slides and areas where you can sunbathe. For something completely different, visit the Grotte di Castellana, a network of caves nearly 2 miles long and 60 metres deep. A guided tour takes around 2 hours and is an ideal way to avoid the heat of the day. There are also smaller cave complexes you can visit near the town of Putignano.. Here at Villa Plus, our customers are always at the forefront of our minds and we believe that our individually selected self-catering villas, in Puglia, give you a choice that you’ll struggle to resist. Enjoy the luxury of a peaceful countryside retreat, with plenty of outside space to relax and dine al fresco. Some of our villas are trullis converted into comfortable villas and all have the added bonus of a private swimming pool. 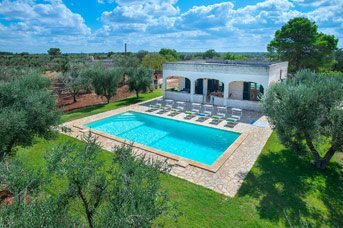 All our villas in Puglia are located in or near the Valle d’Itria, an area famed for its historic towns and landscapes, unchanged for centuries yet still a joy to explore. You’ll have a home away from home with plenty of space around it, a private pool and stretching views of the surrounding olive groves. 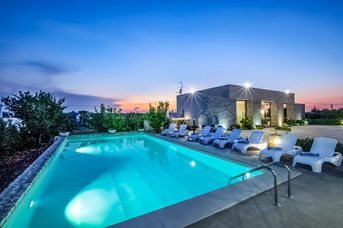 Each villa is within 20 minutes’ drive of a town so you can dine in restaurants or pick up essentials at the local markets and supermarkets to make your own Pugliese feast. As locals to the destination, we’re on hand 24-7 to ensure you have that perfect getaway that you’ve been dreaming of. 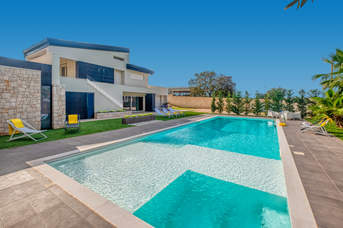 We live and breathe villa holidays and want to ensure you leave Puglia loving it just as much as we do..
Our villas are all located in the central region of Puglia known as Valle D’Itria and a convenient 20 minutes’ drive from one of the 'White Towns'. There are a number of towns in this region, the most famous and northerly being Alberobello. To the west lies Noci while Locorotondo Martina Franca, Cisternino, Ostuni and Ceglie Messapica are east or south east. Between all the towns are plains and rolling hills covered in woodlands, vineyards and farms, a landscape largely unchanged for centuries. The distinctive trulli houses are scattered across the rural landscapes here. Their white walls and grey roofs can be seen in every area but particularly in Alberobello, where 1,400 form a town which has been recognised by UNESCO. A short walk up a hill is the other half of the town which has the Church of San Medici, the weekly market and a number of cafes and restaurants. A town yet to be touched by volumes of tourists, Ceglie Messapica has retained the traditional way of life with a weekly market. It has many elegant buildings and numerous streets to explore where you’ll find bars and restaurants hidden away. Set on top of a steep hill with excellent views of the surrounding countryside, Cisternino has a couple of distinctive features including an elegant central piazza surrounded by restaurants and boutiques. An elegant town with a series of squares linked by narrow winding streets. It has some very fine Baroque architecture, including a palazzo with amazing frescos, but retains a friendly, small town feel. The weekly market is one of the most renowned in the area. Each year from mid-July to early August, it plays host to an arts festival with classical concerts and operas. Located to the west of Alberobello, Noci is a small, relaxed town with a reputation for excellent wine and dairy products which is less well known as a tourist destination. There are a number of small courtyards which are interesting to wander around. Discover hidden passageways lined with boutiques, cafes and restaurants or relax with an excellent artisanal gelato in a sunny piazza while taking in the ornate architecture of Ostuni, one of the 'White Towns'. San Vito dei Normanni is close to Brindisi and enjoys the best of both worlds. You can experience the local Pugliese way of life but will also be close enough to the famous White Towns, some local beaches and key tourist attractions. Located over 430 yards above sea level, on the highest point in the province of Brindisi, Selva di Fasano is often known as ‘the Italian balcony of the Orient’. Here you can enjoy not only panoramic views of the Adriatic Coast but also the pristine natural setting surrounded by forests of cypress, chestnut, pine, oak and carob trees. For an authentic Puglia experience, discover the small village of San Michele Salentino. The village sits in the countryside, surroundedby olive groves where you’ll be able to see the famous trullis, the conical houses for which Puglia is famed. One of the least known regions of Italy, Puglia is a joy to discover for many reasons. The land, sea and towns each have their own appeal. Hire a car and make the most of your time in this fascinating place. Alberobello has around 1,400 trulli, the distinctive houses with conical roofs for which the region is famous. The “Trulli Zone” of the town spreads up a hillside and is perfect for strolling around, taking photos and shopping for souvenirs in the many gift shops. There is a small museum explaining how life would have been lived in a trulli. The limestone of Puglia has been worn away for 100,000 years creating caves and grottoes across the region, many of which have been turned into churches and visitor attractions. Grotte di Castellana is by far the largest with a network of nearly 2 miles. A guided tour takes around 2 hours or there is a shorter option of about 50 minutes. To the south of Brindisi, Lecce is a city worth exploring for its Roman ruins, medieval castle and Baroque churches. The interior and exteriors of the many churches are equally ornate and make great use of the local limestone which is carved into designs of fruit, flowers and clambering vines which also decorate many of the public building throughout the city. For centuries, the naturally formed caves of the region around Matera were used as homes for millennia and it was only in the 1950s that the final occupants left. Today, they are being restored and this unique landscape can be appreciated. You may recognise it as it has been used in various films. This up market seaside resort is divided by a deep gorge which cuts through the centre of the old town and ends in a rocky beach surrounded by cliffs where people like to dive into the clear, deep sea. There are several restaurants overlooking the beach which specialise in seafood. Pass through a gateway into the old town and stroll around the maze of streets until you come to the viewing point over looking the beach and sea caves, a great photo spot. Stretching along the Adriatic Sea, the coastline of Puglia is a mixture of small coves and larger sandy beaches. Beach clubs and lidos are popular and you'll find plenty to choose from around Savelletri and Villanova. You can also pack a picnic and head to one of the sandy coves which have little in the way of facilities but offer an opportunity to swim in the aquamarine sea and relax on a beach. There is a small beach in the centre of Monopoli close to the city walls. Stroll through the historical centre, around the harbour with colourful fishing boats to the castle. There are a few restaurants along the sea front and plenty in the old town from contemporary bars to traditional trattorias. North of the town, there are simple, local beaches with limited facilities so you might want to bring your own picnic. At the mouth of a rocky gorge, surrounded by cliffs that people like to dive from into the clear, deep sea, Polignano a Mare beach has a stunning setting. There are several restaurants overlooking it which specialise in seafood. Pass through a gateway into the old town and stroll around the maze of streets until you come to the viewing point over looking the beach and sea caves, a perfect photo spot. A combination of port and holiday resort, Savelletri is a popular spot for a day out. Head to the harbour where you can take a stroll around and admire the pleasure and fishing boats. There are plenty of fish restaurants or just enjoy a chilled wine or "gelato" and sit in the sun. Up and down the coast, bathing areas can be found, just park where you see a spot. You may also visit one of the local lidos where you can hire sun loungers and parasols and use the snack bar. On the coast, south of Carovigno and to the north of Brindisi, you’ll find Torre Guaceto National Park, renowned for its dunes and sandy beaches. You can hire snorkelling equipment or bikes to see the area in depth and at a leisurely pace. On the coast close to Ostuni, Villanova has several beaches in and around the town including a wide sandy public beach which slopes gently in the sea with some sun beds are available for hire. There are also upmarket beach resorts where you can hire a sunbed for the day and use the onsite restaurant. To the north and south of the town are simple coves and bays with limited or no facilities beyond a car park. Food lovers will be in heaven with the regional cooking of Puglia which uses local ingredients harvested from the land and sea, often simply prepared. Make sure you leave room for la dolce, or something sweet at the end of a meal as there are plenty of local treats to choose from made with locally grown almonds and cherries. Every town in Puglia has a weekly market where farmers and food producers bring their produce to town to sell to the locals. Starting early in the morning, they are finished by lunchtime. It’s a great way to both see local life and pick up a few fresh bargains. 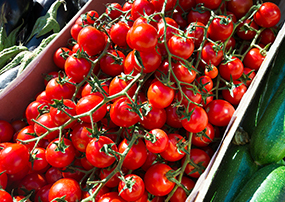 Visit any of the markets to find out which fruits and vegetable are in season. Depending on the time of year, you can expect to see cherries, peaches, melons and figs. Vegetables are always available, from succulent tomatoes, which make delicious salads and sauces, to spicy local chillies which add a kick. Antipasti – If you’re not sure where to start, antipasti a great choice and features on many restaurant menus. It’s a good way to try a choice of dishes, particularly if you are dining as a group, as you will usually be brought a selection of cured meats, local cheeses, fish and vegetable dishes. Pasta - As with most of Italy, pasta dishes are widely available. The most popular shape is the orecchiette, or little ears. They are made simply from flour and water and without egg. 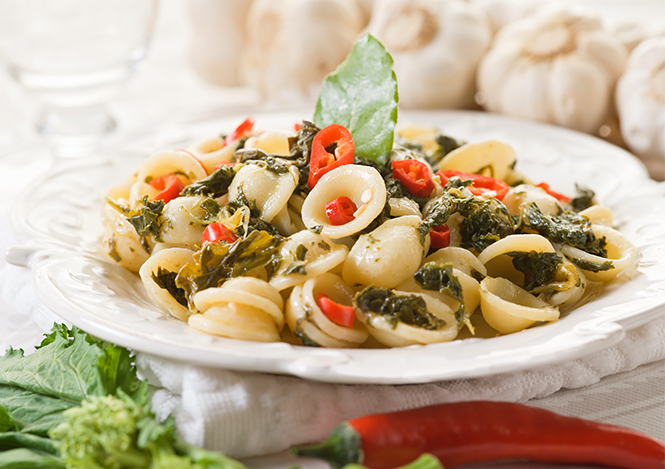 A well-known local speciality is orecchiette con le cime di rapa , a spinach-like leaf cooked with chilli, garlic and plenty of olive oil - very simple but tasty. For a stronger taste, try them with the aged ricotta, la ricotta forte, which is pungent like a strong blue cheese. Arrosteria – Visit Cisternino to try a unique dining experience where the local butcher shops turn into restaurants each evening. You simply choose your preferred meats and they will grill it over a wood fire and serve simply with potatoes. Try a bombette, pork wrapped around cheese and barbecued. Olive oil – One of Puglia’s main exports with the region producing 40% of all olive oil in Italy, so you can expect it to be widely used. In simple Caprese salads, olive oil’s grassy, green flavours work so well against the juicy, acidic tomatoes and the creamy mozzarella. It’s also delicious with freshly baked bread dipped in it. Fritto Misto – As you’d expect in a coastal area, fish is a staple on many menus with fritto misto , lightly battered and fried fish and shellfish, a popular choice. Wine – The Primitivo and Negroamaro grow well in Puglia. The wine produced in the Salento region, south of Brindisi, is particularly well respected and good value. Traditionally, this cucina povera pasta dish is made with the leaves from the tops of turnips but you can substitute spinach or kale. Wash the spinach or kale thoroughly and drain.